“We did not inherit the Earth from our ancestors; we just borrowed it for the future”. This was the key message conveyed to the youth of Bhutan during the International Youth Day celebration at Samdrup Jongkhar on 12th August 2016. Personally, it was a great privilege for me to be part of the team from the Youth Center Division, Department of Youth and Sports, Ministry of Education to leave for Samdrup Jongkhar to coordinate the event. Against the warning of incessant Monsoon rain and the threats of terrorist attacks in the Indian State of Assam, we hit the road on 7th August 2016 from Thimphu to celebrate this year’s International Youth Day with the youth of Samdrup Jongkhar on 12th August 2016. The International Youth Day has been observed in Bhutan since 2010 to recognize the potentials of young people and to celebrate their key achievements in various fields. But for five consecutive years, we celebrated the day only in Thimphu and hence, those youth living in other Dzongkhags could not get the opportunity to be part of it. So this year, for the first time in six years, we decided to take the event out of Thimphu. In line with the UN theme for the day “Road to 2030: Eradicating Poverty by Achieving Sustainable Development through Sustainable Production and Consumption”, we decided to collaborate with Samdrup Jongkhar Initiative (SJI (, a civil society organization that focuses on GNH-based developmental activities especially in rural communities to achieve sustainable development and poverty eradication. So this was the main reason why we chose to travel all the way to Samdrup Jongkhar to celebrate the event this year. By the grace of God, we had a smooth ride although we had to cut our way through some foggy places on our way to Phuntsholing. When we reached Phuntsholing in the late afternoon, we were greeted by light rain that somehow helped the air to cool down. It was still very hot especially for those of us who are accustomed to the climatic conditions of Thimphu. We put up in Peljorling Hotel for the night and resumed our journey to Samdrup Jongkhar early next morning. 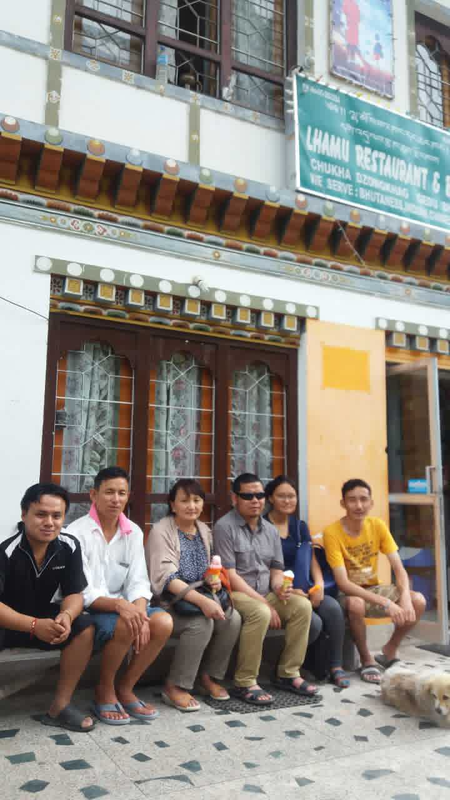 We reached Samdrup Jongkhar in the afternoon on 8th August and directly went to visit the Samdrup Jongkhar Youth Center which is housed in the erstwhile Dharma Sal. This was the same place where I slept several times during my school days. We often had to wait for days to get the bus tickets during those student seasons and with limited money in the pocket, we had no choice but to take refuge in the Dharma Sal which used to be very cheap. So I was reliving those old memories as I entered the Center. Our accommodation was arranged in the Dzongkhag guest house and although there was no air-condition facilities, we had a pleasant stay. It was about 2 kilometers away from the main town, far up in the midst of tall trees and bushes that provided us with cool air and shades. On 9th August, we visited the venue, made arrangements and prepared for the preliminary forum to be held the next day. On 10th August, we had the preliminary forum with over 50 youth. We had a number of interactive sessions such as presentations, screening of documentaries and group activities. The youth of Samdrup Jongkhar were really excited to be part of this special event. Both the participants and officials from relevant agencies wished if more of such programs could be brought to Samdrup Jongkhar so that more youth could be engaged meaningfully. On the actual day on 12th August, the grand event began with the arrival of the Chief Guest and Marchang ceremony, followed by the singing of National Anthem and Zhabten. The entire program was handed over to the youth volunteers to manage since it was their day. So starting from the Master of Ceremony, we had youth facilitating and leading the program. The main message for the day was how to achieve sustainable development and eradicate poverty by minimizing the loss of resources or managing wastes properly. The panel discussion which was an integral part of the program focused on waste management and effective management of community resources so that the sustainable development goals can be achieved. The Hon’ble Drangpoen of Samdrup Jongkhar Dzongkhag Court of Justice graced the occasion as the Guest of Honor. Overall, it was a very fruitful day as it provided a great platform for over 150 youth to interact and participate in the event. There were also a number of cultural performances by students that added fun to the event. The program ended at 2 o’clock in the afternoon and immediately afterwards, we headed to Jigme Namgyel Engineering College to interact with the YPeer members there. It was a hectic but satisfying day for all of us. We started our journey back on 13th August. Once again, we passed through the Indian States of Assam and West Bengal peacefully without any problem on the way. After spending a night at Phuntsholing, we had our final leg of pleasant journey to Thimphu the next day. The week-long break from Thimphu was good enough to refresh our minds and rejuvenate ourselves. Only this time I realized how much I love Thimphu at this moment: its cool air, fresh water and more considerate Monsoon. Many foreigners like me know very little about Thimphu and you have just shared about its natural sanctuary amidst nature's beauty. I often see the youths today as the nation's future leaders and would advise them to walk the meaningful paths of lives.